The WW domain-containing oxidoreductase (WWOX) gene, frequently altered in breast cancer, encodes a tumor suppressor whose function is mediated through its interactions with cancer-related proteins, such as the pro-apoptotic protein p73α. To better understand the involvement of WWOX in breast tumorigenesis, we performed a yeast two-hybrid screen and co-immunoprecipitation assays to identify novel partners of this protein. We characterized the vesicular overexpressed in cancer pro-survival protein 1 (VOPP1) as a new regulator of WWOX. In breast cancer cells, VOPP1 sequestrates WWOX in lysosomes, impairs its ability to associate with p73α, and inhibits WWOX-dependent apoptosis. 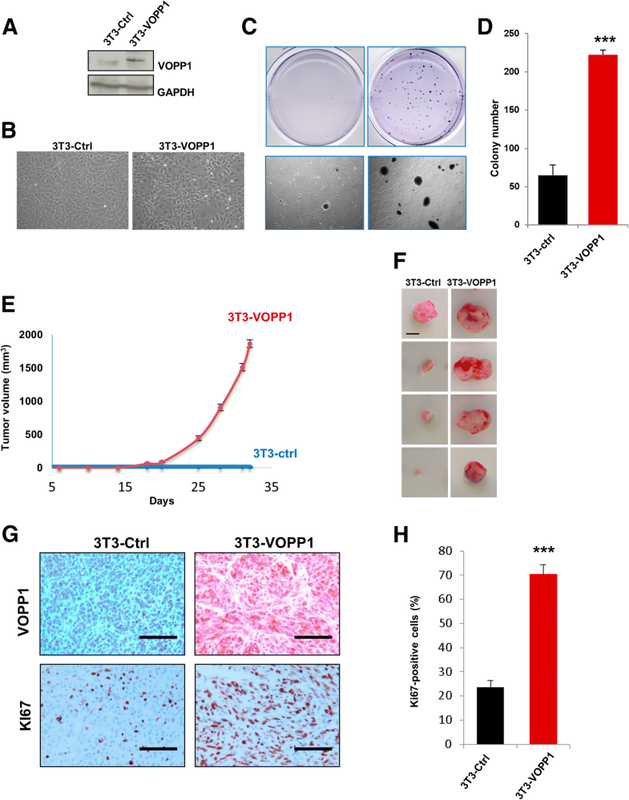 Overexpressed VOPP1 potentiates cellular transformation and enhances the growth of transplanted tumors in vivo. VOPP1 is overexpressed in breast tumors, especially in tumors that retain WWOX. 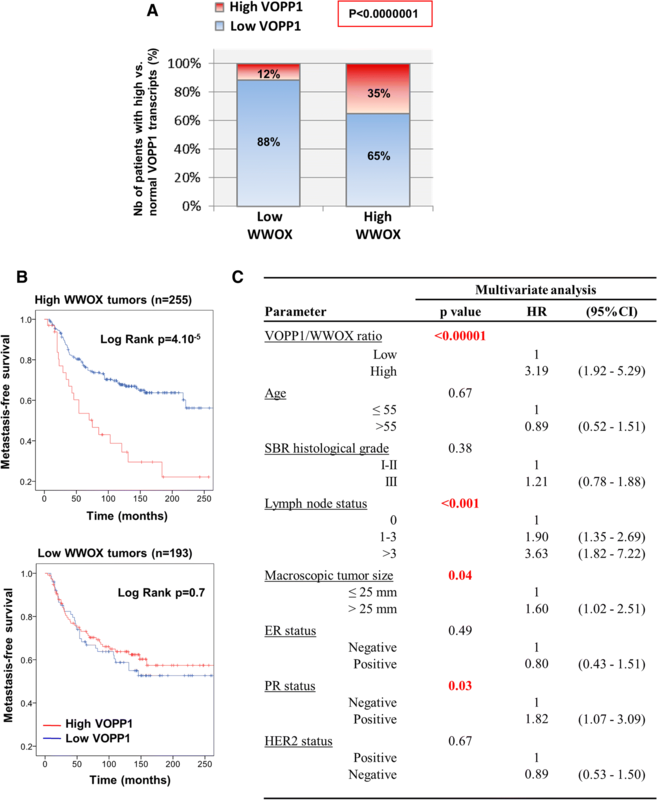 Moreover, increased expression of VOPP1 is associated with reduced survival of patients with WWOX-positive, but not with WWOX-negative, tumors. 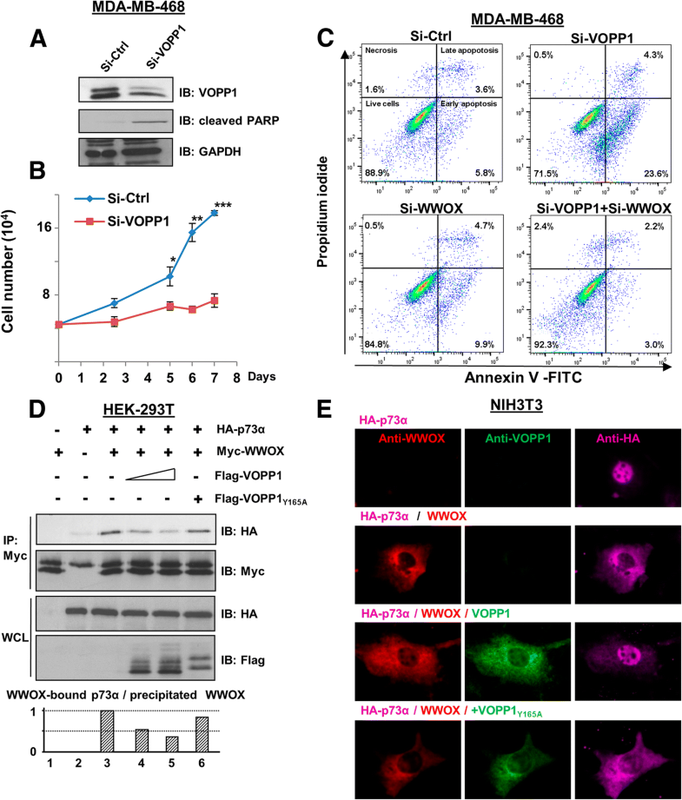 These findings emphasize the importance of the sequestration of WWOX by VOPP1 in addition to WWOX loss in breast tumors and define VOPP1 as a novel oncogene promoting breast carcinogenesis by inhibiting the anti-tumoral effect of WWOX. WWOX has been characterized primarily as a tumor suppressor gene spanning the fragile site FRA16D . In the last few years, it has become evident that WWOX protein has pleiotropic functions, playing critical roles not only in cancer but also in other severe human pathologies including metabolic disorders and CNS-related syndromes [2, 3]. Importantly, homozygous mutations of WWOX were recently identified as responsible for an inherited neural disorder characterized by cerebellar ataxia, epilepsy, and mental retardation (OMIM # 616211) . In human cancers, according to The Cancer Genome Atlas, mutations affecting the WWOX gene are rare events (Reference 3 and http/www.cbioportal.org for updates). However, altered WWOX expression is frequent in tumors, which is mainly due to hemi- and homozygous loss and rearrangements on chromosome arm 16q [3, 5]. Heterozygous deletions of WWOX gene were observed in more than 50% of breast tumors and reached up to 80% in ovarian carcinomas [3, 5–7]. In addition, loss or reduced WWOX expression may also result from epigenetic alterations and post-translational modifications such as promoter hypermethylation, miRNA targeting, and proteasomal degradation [5, 8, 9]. Overall, low levels of WWOX expression were associated with a poor clinical outcome, which suggested an important role of the protein in a broad range of human cancers . The tumor suppressor function of WWOX was demonstrated by studies showing that its ectopic overexpression inhibited tumor growth [10–13]. In genetically engineered mice, complete ablation of WWOX resulted in early postnatal lethality, which precluded the analysis of WWOX involvement in tumorigenesis in WWOX−/− mice. However, increased incidence of spontaneous and induced tumors of the lung, breast, and B cell lymphomas was observed in WWOX hypomorphic and heterozygous WWOX+/− animals [14–17]. The WWOX protein consists of two N-terminal WW domains (WW1 and WW2) and a C-terminal short-chain dehydrogenase/reductase domain (SDR) [6, 18]. The WW domains are well-characterized modules that mediate protein-protein interactions . The WW1 domain is the predominant functional interacting domain of WWOX, which belongs to the largest group of WW domains, i.e., group I that specifically recognizes proteins with PPxY consensus motifs . A recent report revealed that the WW1 module interacts with an extended list of L/PPxY-containing proteins, thereby acting as a versatile platform linking WWOX with numerous multiprotein complexes involved in important processes such as transcription, RNA processing and splicing, chromatin remodeling, metabolism, and various cancer-related pathways . Thus, WWOX suppressor activity relies on its binding capacities to known cancer-related proteins such as p73, deltaNp63, AP2γ, c-jun, Erbb4, c-Met, RUNX2, and Dvl-2 . Several of these WWOX-binding proteins are transcription factors or co-factors. In most cases, WWOX suppressed their activity by sequestering them in the cytoplasm [3, 21, 22]. At the cellular level, WWOX has been shown to promote apoptosis. Restoration of WWOX expression in several types of cancer cells induced apoptosis [11, 12]. In particular, Aqeilan et al. demonstrated that WWOX bound to and sequestered p73 in the cytoplasm. The cytoplasmic WWOX-p73 complex induced apoptosis independently of p73 transcriptional activity . More recently, emerging evidence also suggests an important role for WWOX in the DNA damage response (DDR). It was shown that DNA damage triggered WWOX accumulation in the nucleus where it bounds to ATM protein and activated DDR . Therefore, loss of WWOX in human tumors might also lead to genomic instability, another hallmark of cancer . In this report, we screened for new WWOX-interacting proteins to gain insight into the involvement of the WWOX tumor suppressor in breast cancer. We highlighted VOPP1 as a new molecular partner of WWOX. The VOPP1 gene (previously known as ECOP or GASP) is localized at the frequently amplified 7p11.2 locus and is often co-amplified with EGFR [26, 27]. VOPP1 overexpression has been observed in multiple malignancies such as glioblastoma and gastric, head and neck, lung, and breast cancers [28–30]. Interestingly, in different cellular models, VOPP1 depletion resulted in apoptosis, while ectopic expression conferred a pro-survival phenotype to cancer cells, which strongly suggested VOPP1 as an anti-apoptotic protein [31, 32]. Our study aimed at better characterizing the role of WWOX and VOPP1 binding in breast cancer. We performed a yeast two-hybrid screen to identify new WWOX-interacting proteins [22, 33]. As a bait, we used the full-length protein (NP_057457) and a shorter isoform (WWOXv2, NP_570607) containing the two WW domains and a truncated SDR domain. We screened at saturation a highly complex human placenta library and identified ten clones encoding the C-terminus region of the VOPP1 protein. To validate that the VOPP1-WWOX interaction occurred in mammalian cells, we generated a Flag-tagged VOPP1 expression construct that was co-expressed with a Myc-tagged WWOX plasmid in HEK-293T cells. Cell lysates were immunoprecipitated with anti-Flag or anti-Myc antibodies. Flag-VOPP1 was specifically co-immunoprecipitated with Myc-WWOX by an anti-Myc antibody and reciprocally (Fig. 1a). To examine the existence of endogenous VOPP1-WWOX complexes in breast cancer cells, we first evaluated the expression of VOPP1 transcripts and proteins in a series of ten human breast cancer cell lines (Fig. 1b, c). 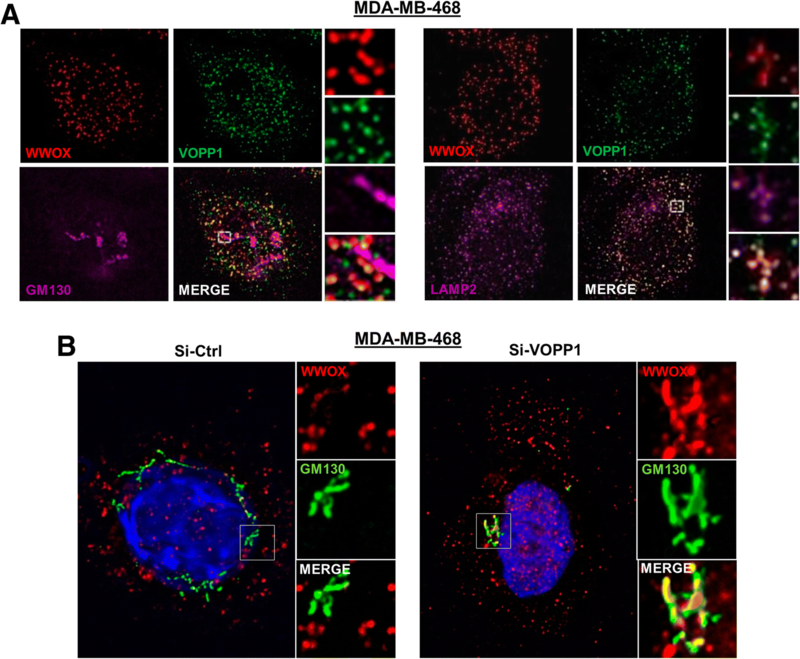 The highest levels of expression for VOPP1 were observed in MDA-MB-468 cells. This line was thus used to perform a co-immunoprecipitation assay using an anti-VOPP1 antibody (Fig. 1d). We found that WWOX specifically co-precipitated with VOPP1 indicating that endogenous WWOX and VOPP1 were physically associated in breast cancer cells. Next, we investigated which domains of both proteins were crucial for WWOX-VOPP1 interaction (Fig. 1e). First, we investigated the binding capacity of WW1, the predominant interacting domain of WWOX . For that, we generated the WWOXY33R mutant and tested its ability to bind VOPP1, the Y33R mutation inhibiting the binding ability of WW1 . The Y33R mutation in WWOX abolished the WWOX-VOPP1 interaction (Fig. 1e), which indicated that the WW1 module was indispensable for the WWOX-VOPP1 association. Then, by examining the VOPP1 protein sequence, we identified three PPxY motifs in the proline-rich C-terminal region of the protein: PPYY119, PPAY157, and PPPY165. We generated three VOPP1PPxY mutants in which the conserved tyrosines were replaced by alanine residues and tested their ability to bind WWOX. The results showed that WWOX-VOPP1 interaction was strongly affected by the mutation of tyrosine 165 (Fig. 1e). These observations indicated that the PPPY165 motif was required to sustain a robust interaction of VOPP1 with the WW1 domain of WWOX. Altogether, these results indicated VOPP1 as a novel partner of WWOX. WWOX- and VOPP1-interacting proteins should reside, at least transiently, in the same cellular compartment. Human WWOX was reported to localize in the Golgi apparatus [10, 19], while VOPP1 displayed a vesicular distribution consistent with endosomal/lysosomal compartmentalization [28, 30]. To determine the subcellular localization of the WWOX-VOPP1 complex, we transiently expressed WWOX and VOPP1 either alone or in combination in HeLa cells. As expected, WWOX expressed alone was largely accumulated in GM130-positive structures in line with a Golgi localization  while VOPP1 expressed alone showed a close apposition to LAMP2 patches, but not to EEA1 (marker of early endosomes) or GM130 patches, indicating a late endosomal/lysosomal localization  (Fig. 2a, b). Interestingly, when co-expressed with VOPP1, WWOX completely lost its typical Golgi distribution and exhibited a punctate pattern consistent with lysosomal structures as shown by the staining overlap of WWOX-, VOPP1-, and LAMP2-positive vesicular bodies (Fig. 2c and Additional file 1: Figure S1A). We then asked whether the relocation of WWOX was related to the VOPP1 binding by co-expressing WWOX with the VOPP1Y165A mutant. 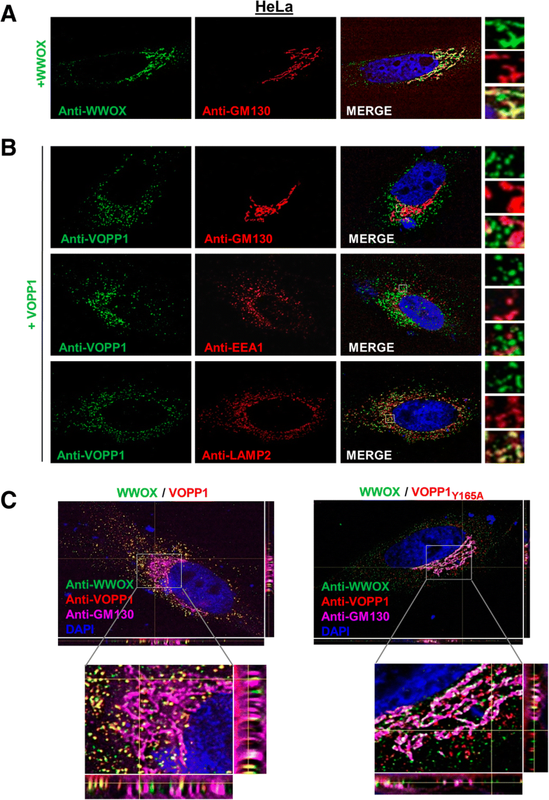 In VOPP1Y165A-expressing cells, WWOX largely remained in the Golgi compartment (Fig. 2c and Additional file 1: Figure S1B). Next, we analyzed the localization of the endogenous WWOX-VOPP1 complex in MDA-MB-468 cells and observed no overlap of WWOX staining with GM130-positive structures (Fig. 3a). In contrast, perinuclear co-localization of WWOX, VOPP1, and LAMP-2 labeling was clearly distinguished, which indicated that the endogenous complex was associated with lysosomes (Fig. 3a). In these cells, we analyzed the effect of VOPP1 depletion on WWOX expression profile by RNA interference. In contrast to control cells (Si-Ctrl), WWOX extensively co-localized with the GM130-positive structures in si-VOPP1-treated cells (Si-VOPP1) (Fig. 3b). Thus, the inhibition of VOPP1 expression in MDA-MB-468 cells induced the re-localization of WWOX from the lysosomal vesicles to the Golgi apparatus. Altogether, these results strongly indicated that the WWOX and VOPP1 complex resides in the late endosomes/lysosomes and VOPP1 had the ability to sequester WWOX in this subcellular compartment. Our observations prompted us to investigate whether the VOPP1-WWOX interaction may have affected the apoptotic function of WWOX. First, we determined the effects of suppressing VOPP1 on cell death in MDA-MB-468 cells. Si-RNA treatment (70% efficacy, Fig. 4a) reduced the viability of VOPP1-depleted cells compared to the Si-Ctrl-treated cells (Fig. 4b). Furthermore, VOPP1 silencing greatly increased the expression of cleaved PARP, a cellular marker of apoptosis (sevenfold increase, Fig. 4a). These results indicated that the depletion of VOPP1 in MDA-MB-468 cells affected cell viability by inducing apoptosis. We then examined the ability of VOPP1 knockdown to induce the pro-apoptotic activity of WWOX. Upon Si-VOPP1 treatment, MDA-MB-468 cell death showed a fourfold increase (23.6% in Si-VOPP1 cells compared to 5.8% in control cells, Fig. 4c) as measured by Annexin V/PI staining coupled with flow cytometry. Remarkably, VOPP1 suppression had no effect in WWOX-depleted cells, which suggested specific regulation of WWOX-mediated apoptosis by VOPP1 protein (Fig. 4c). Conversely, WWOX-mediated cell death in A549 cancer cells was overcome by ectopic expression of VOPP1 but not VOPP1Y165A indicating that VOPP1 overexpression inhibited WWOX-dependent apoptosis (Additional file 2: Figure S2A-B). To highlight the underlying mechanisms, we examined the effect of VOPP1 on WWOX-p73α complex known to induce apoptosis . By performing co-immunoprecipitation experiments, we found that ectopic expression of VOPP1, but not VOPP1Y165A, affected the ability of WWOX to associate with p73α (Fig. 4d). We also found that the sequestration of p73α in the cytoplasm by WWOX was inhibited by ectopic expression of VOPP1 but not VOPP1Y165A, which confirmed the negative effect of VOPP1 on the WWOX-p73α association (Fig. 4e). We then examined the marker of apoptosis, cleaved PARP, under these experimental conditions. We found that overexpressed WWOX increased cleaved PARP expression and that this effect was inhibited by ectopic expression of VOPP1 wild-type but not VOPP1Y165A (Additional file 2: Figure S2C). However, we did not detect the significant cooperative effect of WWOX and p73α on cleaved PARP expression, probably due to the triple transfection condition. Indeed, in double transfection conditions, we found that WWOX and p73α strongly cooperate to induce cleaved PARP expression (Additional file 2: Figure S2C-D). Altogether, these results suggested that VOPP1 inhibited WWOX-dependent apoptosis at least in part by preventing the WWOX-p73α interaction. Our findings led us to assume that VOPP1 might function as an oncogene. To test this hypothesis, we examined whether VOPP1 overexpression would be sufficient to transform non-cancerous cells. Stable expression of VOPP1 in NIH3T3 cells (3T3-VOPP1) resulted in classical morphological transformation as evidenced by the appearance of small, refractile, spindle-shaped cells (Fig. 5a, b). To directly assess the transforming potential of VOPP1, we performed a soft agar colony formation assay and found that stable expression of VOPP1 in NIH3T3 cells also induced anchorage-independent growth in soft agar as shown by an increase of both number and size of colonies compared to control cells (Fig. 5c, d). Furthermore, injection of 3T3-VOPP1 cells into immunocompromised mice led to tumor formation in vivo. The tumor growth rate and mean tumor volumes were drastically increased in mice injected with 3T3-VOPP1 cells compared to control cells (NIH3T3 cells stably transfected by the empty vector, 3T3-Ctrl) (Fig. 5e). Since no tumors were obtained in the control group at day 35, a second experiment was carried out and followed for a longer time period. At the end of the experiments (week 25), only half of the control mice had palpable tumors whereas all 3T3-VOPP1 mice were already sacrificed for tumors reaching the ethical size. 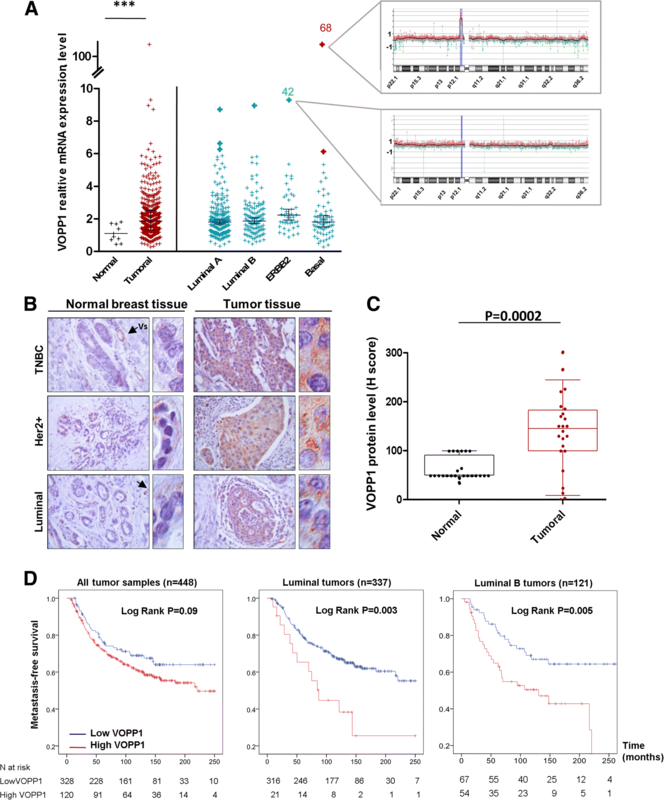 Immunohistological analyses of tumor xenografts showed a higher number of Ki67-positive cells in 3T3-VOPP1 tumors compared to the 3T3-Ctrl tumors (Fig. 5g, h). Collectively, these results indicated that VOPP1 had transforming activity and induced a tumorigenic phenotype. To evaluate the clinical relevance of VOPP1 in breast cancer patients, we investigated its expression in a series of 448 invasive tumors from breast cancer patients with known long-term outcome and ten normal breast tissues by qRT-PCR analysis (Additional file 3: Table S1). In line with studies on other tumor types [26, 28–32], we found that 25% of breast tumors (112/448) showed VOPP1 overexpression (≥ 2.5-fold increase as compared to expression in normal breast tissue) (Additional file 3: Table S1). Relative expression of VOPP1 was significantly increased in the primary breast tumors (p = 8.10−4, Mann-Whitney U test, Fig. 6a). We then characterized the breast tumors according to the four major molecular subgroups, i.e., luminal A (n = 216), luminal B (n = 121), ERBB2 (n = 44), and triple-negative tumors (n = 67) . All subgroups of breast tumors showed an increased level of VOPP1 transcripts (p = 1.10−3, 1.10−3, 1.10−4, and 6.10−3, respectively) (Fig. 6a). Of note, the ERBB2 tumors exhibited slightly higher amounts of VOPP1 compared to the other subgroups. To confirm these findings, we interrogated the Oncomine database for VOPP1 expression in several additional breast cancer datasets and obtained similar results (Additional file 4: Figure S3A-B). In light of the VOPP1 gene location within the 7p11.2 chromosomal region, which contains EGFR, and frequent amplification in several malignancies, including basal-like breast cancers [26, 27], we investigated whether altered VOPP1 expression was due to gene amplification. We performed a CGH array analysis of samples that exhibited the highest levels of VOPP1 mRNA (Fig. 6a). We found that 7p11.2 amplification was observed only in the triple-negative tumors (2/2 cases), whereas luminal and HER2 tumors showed no genomic alteration (0/5) (Fig. 6a and Additional file 4: Figure S3C). Therefore, gene amplification was not the main mechanism leading to VOPP1 overexpression in breast cancers. Next, we examined VOPP1 protein expression in a series of 24 human breast tumors. In all cases, adjacent non-cancerous tissue revealed weak staining for VOPP1 in the luminal and myoepithelial layers of the mammary glands. The VOPP1 protein showed a higher expression in the blood vessels (Fig. 6b). In accordance with our qRT-PCR results, breast tumors showed increased expression of VOPP1 protein (Fig. 6c, p = 0.0002) and this higher expression was not linked to any specific breast tumor subtype (Additional file 5: Figure S4A-B). Notably, VOPP1 staining showed a predominant granular cytoplasmic distribution reminiscent of the vesicular structures observed in vitro (Fig. 6b and Additional file 5: Figure S4B). To evaluate the prognostic value of the VOPP1 expression on breast cancer patients’ survival, we performed a univariate analysis. As shown by the Kaplan-Meier curve, among the 448 tested patients, those having tumors with high VOPP1 mRNA expression tended to have reduced metastasis-free survival compared to those expressing lower VOPP1 mRNA levels, even though the difference was not statistically significant (Fig. 6d, the first graph on the left). We then reasoned that the potential contribution of VOPP1 expression in the unfavorable breast cancer clinical outcome might be due to its inhibitory effect on WWOX tumor suppressor activity. In this case, we expect that the impact of high VOPP1 expression could be more relevant in tumors not inactivated for WWOX expression. Since it has previously been demonstrated that WWOX expression positively correlates with expression of hormone receptors [37–39], we thus performed a log-rank test in the subgroups of luminal tumors (the hormone receptor-positive tumors) and the luminal B subtype that are those with a higher risk of metastasis. Interestingly, high VOPP1 mRNA expression was significantly associated with an increased risk of metastasis in the subgroups of luminal tumors (log-rank, p = 0.003) and luminal B tumors (log-rank, p = 0.005). In accordance with our findings, the analysis of independent datasets showed a significantly worse prognosis in luminal B tumors (Additional file 5: Figure S4C). After adjusting for standard clinicopathological prognostic factors, VOPP1 expression remained an independent prognostic factor in luminal B breast tumors (p = 0.003; Additional file 6: Table S2). We next examined the concomitant expression of VOPP1 and WWOX in our series of breast tumors. In keeping with previous reports [37–39], WWOX expression correlated positively with expression of hormone receptors, and reduced WWOX mRNA levels tended to be associated with poor prognosis, ER/PR-negative tumors (Additional file 3: Table S1 and Additional file 5: Figure S4D). Most importantly, we observed a negative correlation between WWOX underexpression and VOPP1 overexpression (Fig. 7a). Indeed, tumors that expressed decreased levels of WWOX mainly showed low VOPP1 expression (88%), whereas tumors with high WWOX levels exhibited a higher proportion of VOPP1 overexpression (12 vs. 35%), (p < 1.10−7). Since VOPP1 and WWOX have concomitant patterns of expression, we evaluated the presence of significant interaction between VOPP1 and WWOX expression on breast cancer metastasis-free survival rates. Therefore, we considered a Cox regression model, which included both variables (WWOX and VOPP1 expression) and an interaction term (VOPP1*WWOX). Whereas VOPP1 and WWOX had non-significant p values related to the outcome, the hazard ratio associated with the interaction term was estimated to be equal to 3.41 and was statistically significant (p = 0.02) indicating a substantial interaction of both variables in the patient metastasis-free survival (Additional file 7: Table S3). To evaluate whether more discrete variations of VOPP1 vs. WWOX expressions could predict the risk of breast cancer metastasis with a higher efficacy, we tested the VOPP1/WWOX ratio in univariate and multivariate analyses. Indeed, we found that the high level of VOPP1/WWOX ratio decreased the survival of patients that retained WWOX expression (log-rank test, p = 4.10−5) but not of patients whose tumors had WWOX gene alterations (Fig. 7b). Moreover, interestingly, in a multivariate model (Fig. 7c), the VOPP1/WWOX ratio was a highly significant variable (p < 0.00001) with a hazard ratio of 3.2 (95% CI 1.9–5.3). All these observations support strongly that overexpression of VOPP1 induces breast cancer by impairing the tumor suppressive activity of WWOX. In this study, we defined VOPP1 as a new molecular partner and an inhibitor of the apoptotic function of WWOX in breast cancer cells. We demonstrated that VOPP1 potentiated cellular transformation and enhanced tumorigenesis in vivo. Moreover, we showed that VOPP1 was overexpressed in breast tumors; this overexpression was predominant in tumors that retained WWOX expression and was associated with reduced metastasis-free survival of patients with WWOX-positive tumors. These findings emphasize the importance of WWOX compartmentation in addition to WWOX loss in breast tumors and define VOPP1 as a novel oncogene that promotes breast carcinogenesis. VOPP1 protein function has not yet been extensively studied. Analysis of the protein sequence did not highlight any obvious functional domains, although it did reveal a transmembrane domain and a signal peptide as predicted by TMHMM2.0 and SignalIP programs. In addition, the protein harbors two endosome/lysosome targeting sequences, namely a YXXΦ motif (Φ is a hydrophobic amino acid) and a dileucine sequence, which suggest its function in the sorting of proteins to the endosome, Golgi apparatus, and lysosome . Interestingly, the VOPP1 protein was not the only WWOX partner that has been shown to belong to the endolysosomal compartment. The E3 ubiquitin ligase ITCH and LITAF/SIMPLE proteins also localize to endolysosomes . LITAF is a tumor suppressor that was previously reported to physically interact with ITCH and induce the relocation of ITCH to the lysosomes, likely interfering with ITCH function. Most importantly, ITCH mediated K63-linked polyubiquitination of WWOX, which led to its nuclear localization and enhanced DDR . Furthermore, the WWOX-ITCH interaction rendered cells more sensitive to p73 pro-apoptotic function . Altogether, these data suggest that WWOX interactions are finely orchestrated to efficiently control the suppression of tumorigenic signaling pathways including DNA repair and tumor cell apoptosis. Independent groups previously characterized VOPP1 as an antiapoptotic protein [31, 32]. Their studies highlighted different underlying molecular pathways, depending on the experimental systems that were used. First, ectopic expression of VOPP1 was shown to prevent apoptosis by regulating NF-κB transcriptional activity in HeLa cells. The authors demonstrated that VOPP1 knockdown delayed the degradation of IκBα, which inhibited the NF-κB pathway. These results might be consistent with our findings as WWOX has been suggested to physically interact with IκBα protein . However, although the role of WWOX in the NF-κB pathway has been described in the human T cell leukemia virus type I (HTLV-I)-mediated tumorigenesis, the functional relationship between WWOX and NF-κB in other malignancies remains to be determined . Alternatively, other studies reported that loss of VOPP1 induced apoptosis via control of the intracellular redox state . In line with these data, increased ROS levels were observed in WWOX-overexpressing larvae in a Drosophila model while Wwox mutants had consistently lower levels of ROS . Importantly, a key role of WWOX in cell metabolism was strongly supported by the severe metabolic defects leading to the early postnatal death of WWOX-null mice . The molecular mechanisms underlying these complex metabolic functions of WWOX are still under investigation. Our results suggest that VOPP1 promotes cancer by inhibiting WWOX-dependent apoptosis; however, we cannot exclude the possibility that VOPP1 acts on cancer by impairing other WWOX functions. This is supported by different studies and observations suggesting that WWOX can act on cancer independently of apoptosis. Notably, many cell lines survive following stable transfection of WWOX; therefore, apoptosis would not be the only mechanism by which WWOX works as a tumor suppressor. Moreover, WWOX interacts with, and modulates the activity of, numerous proteins, such as RUNX2 and Dvl-2, involved in migration and invasion, two cancer-promoting cellular processes [22, 46, 47]. The involvement of VOPP1 in the regulation of these apoptosis-independent WWOX functions remains to be investigated. Growing evidence indicates that WWOX is not a classical tumor suppressor. Unlike most tumor suppressor genes, the inactivation of only one WWOX allele was sufficient to trigger tumor formation . This haploinsufficient phenotype was demonstrated in mice with targeted knockout of a single copy of WWOX or mice with WWOX hypomorphism [14–17]. These studies revealed an increased incidence of lung and breast tumors and B cell lymphomas. Similar to the PTEN tumor suppressor, differences in the types of neoplasias observed in these animal models might be due to the regulation of WWOX by various molecular mechanisms, including VOPP1-mediated relocation, which generates dosage-dependent WWOX functions in human cancers. Further investigations are still required to fully unravel this question. Our data suggested that the involvement of the WWOX pathway in breast cancers might have been underestimated. Consistent with this possibility, by studying our series of 448 breast tumors, we found that the alteration of WWOX function, considered either by underexpression of WWOX or by overexpression of VOPP1, affects 81.69% (364/448) of breast tumors. Our findings may also shed new light on the potential involvement of the WWOX/VOPP1 axis in a broader range of human malignancies. Overexpression of VOPP1 has been reported in several cancers such as a glioblastoma and head and neck, lung, gastric, and pancreatic carcinomas [28, 30], which are malignancies commonly affected by WWOX loss of expression . Therefore, the altered expression of WWOX and aberrant localization should be more precisely scrutinized in these cancers; further studies on this pathway may provide a better assessment of the WWOX/VOPP1 axis in human cancers. Our findings shed new light on WWOX localization and its role in apoptosis and breast tumorigenesis. Whereas a therapeutic approach aimed at restoring WWOX loss of function is not straightforward, our findings open avenues for the development of new therapies targeting this pathway by affecting the VOPP1 oncogene in a broad range of human malignancies. The Myc-WWOX and Myc-WWOXY33R expression vectors were kindly provided by Dr. R.I. Aqeilan. Full-length WWOX cDNA was cloned into a Myc-tagged pCMV vector (BD Clontech, Palo Alto, CA) by using standard protocols. pCMV-Myc-WWOXY33R plasmid (Myc-WWOXY33R) was obtained by site-directed PCR mutagenesis (Stratagene, La Jolla, CA), according to the manufacturer’s instruction . HA-p73α was kindly provided by Dr. G. Melino. p73 cDNA was synthetized by RT-PCR using total RNA extracted from the SH-Sy5y cell line cell. p73 cDNA was sequenced and cloned in-frame with a hemagglutinin (HA) tag into pcDNA3-HA using the NheI and NotI unique restriction sites. The pCDNA3-HA plasmid was constructed by insertion of a BglII/BamHI fragment from pActII (Clontech) into the BamHI site of pCDNA3 (Invitrogen, Carlsbad, CA) [48, 49]. VOPP1 cDNA (519 bp, NM_030796) was amplified by RT-PCR from human tissues (Clontech) expressing the highest levels of VOPP1 RNA (normal kidney, breast, and placenta), as determined in silico by means of the Serial Analysis of Gene Expression (SAGE) program. The PCR product was cloned into the expression vectors p3xflag-CMV-7.1 (Sigma-Aldrich, Saint-Louis, Missouri) (Flag-VOPP1) and pIREShyg3 (Clontech) by using appropriate primers. Site-directed mutagenesis was performed to independently modify the tyrosine residue to alanine in each PPxY motif of the VOPP1 construct according to the manufacturer’s instructions (Stratagene, La Jolla, CA). The tyrosine residue of each PPxY motif was mutated to alanine, generating three mutants: VOPP1Y119A, VOPP1Y157A, and VOPP1Y165A. All constructs were verified by DNA sequencing. All cell lines were purchased from the American Type Culture Collection (ATCC, Manassas, VA) and authenticated every 20 passages using the GenePrint 10 System kit (Promega, Madison, WI). Cells were grown in Dulbecco’ s minimal essential medium (DMEM) or minimal essential medium (MEM), supplemented with 10% fetal bovine serum (Invitrogen, Carlsbad, CA) and 1% antibiotics (50 μg/ml penicillin, 50 μg/ml streptomycin, 100 μg/ml neomycin; Invitrogen), and maintained at 37 °C with 5% CO2. Transfections were achieved using Lipofectamine according to the manufacturer’s instructions (Invitrogen). To generate NIH3T3 cells stably expressing VOPP1, cells were cultured for 3 weeks in a selection medium containing hygromycin (100 μg/ml). Dozens of hygromycin-resistant clones were then picked and expanded. MDA-MB-468 cells were transfected using the HipPerFect Reagent following the manufacturer’s protocol with either the siRNA-negative control or siRNA-VOPP1 and/or siRNA-WWOX (#1027281, #SI03144967, and #SI02777775) (Qiagen, Valencia, CA). For the proliferation assay, MDA-MB-468 cells were seeded in 96-well plates and transfected with control or VOPP1 siRNAs at day 0 and day 3. Cell number was measured using the MTS assay according to the instructions of the manufacturer (Promega). The absorbance at 490 nm was performed on a 96-well microplate reader (Dynatech Laboratories MRX, Chantilly, VA). Cell death was evaluated using the FITC Annexin V kit (BD Biosciences, San Jose, CA). Briefly, cells were washed in PBS with EDTA (1 mM) and resuspended in Annexin V binding buffer (106 cells/ml). Samples were incubated with Annexin V-FITC antibody for 15 min in the dark and propidium iodide was added. Data were acquired on a Becton Dickinson LSR II flow cytometer and analyzed using FlowJO V10 software. Cells plated on glass coverslips were fixed (PBS, 4% paraformaldehyde, 10 min), permeabilized (PBS, 0.1% Tween-20, 10 min), and incubated with PBS containing 5% goat serum and appropriate antibodies. Cells were then stained with DAPI and examined with a fluorescence microscope (Eclipse Ti-S Nikon, Melville, NY). Images were acquired with a wide-field Eclipse 90i Upright Microscope (Nikon) using a × 100 Plan Apo VC 1.4 oil immersion objective and a highly sensitive cooled interlined charge-coupled device (CCD) camera (Roper CoolSnap HQ2). A z-dimension series of images was taken every 0.2 μm via a piezoelectric motor (LVDT; Physik Instrument), and images were deconvoluted . Acquisition, analyses, and quantifications were performed using the MetaMorph Imaging System (Universal Imaging Corp.) and ImageJ software. Anti-VOPP1 polyclonal antibody was produced by inoculating rabbits with two distinct VOPP1 peptides corresponding to amino acids 101-116 (TRQPPNPGPGTQQPGP) and amino acids 137-151 (AFQVPPNSPQGSVAC) (Eurogentec, Seraing, Belgium). The other antibodies used are as follows: anti-WWOX ; anti-WWOX (ref. : sc-20528, Santa Cruz, Dallas, TX, RRID:AB_2216503); anti-VOPP1 (ref. : 12611-1AP, Proteintech, Chicago, IL); anti-GM130 (re. : 610822, BD Biosciences, San Jose, CA, RRID:AB_398141) and anti-EEA1 (ref. : 610457, BD Biosciences, San Jose, CA RRID:AB_397830); anti-LAMP2 (ref. : ab25631, Abcam, Cambridge, MA, RRID:AB_470709); anti-cleaved PARP (ref. : 9541, Cell Signaling, Danvers, MA, RRID:AB_331426); anti-Flag (ref. : F3165, Sigma-Aldrich St Louis, MO, RRID:AB_259529); anti-HA (ref. : MMS-101P, Covance, Indianapolis, IN, RRID:AB_2314672); anti-Myc (ref. : 631206, Clontech Palo Alto, CA); secondary Alexa fluor-conjugated antibodies (ref. : A-11011, RRID:AB_143157, ref. : A-11031, RRID:AB_144696, ref. : A-11034, RRID:AB_2576217, ref. : 11068, RRID:AB_2534112, ref. : 11039, RRID:AB_2534096, Invitrogen Thermo Fisher Scientific Rockford, IL); IgG-dylight 650-conjugated (ref. : A90-516D5, Bethyl Laboratories, Montgomery, TX, RRID:AB_10631368), and HRP-linked antibodies (ref. : 111-035-003, RRDI: AB_2313567, ref. : 115-035-062, RRDI:AB_2338504, ref. : 705-035-003, RRDI:AB_2340390, Jackson ImmunoResearch, West Grove, Pennsylvania). Western blotting and co-immunoprecipitation methods were previously described . 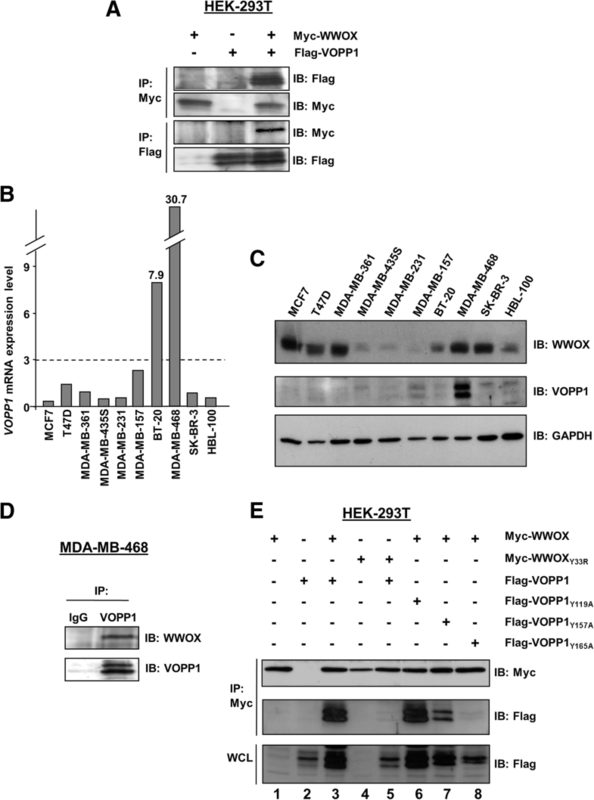 For endogenous WWOX-VOPP1 complexes, cell extracts containing 800 μg of total proteins were subjected to direct immunoprecipitation with the anti-VOPP1 antibody. 3.104 NIH3T3 cells, stably expressing VOPP1 (3T3-VOPP1) or empty vector (ctrl-VOPP1), were mixed with melted 0.35% agarose in DMEM medium and seeded on top of a 0.7% agarose base layer containing the same medium. Culture medium was changed twice per week for 4 weeks, and cells were observed with an optical microscope. 2.106 3T3-VOPP1 or ctrl-VOPP1 cells were injected subcutaneously into the flanks of 7-week-old immunodeficient mice (CB17 SCID, Charles Rivers Laboratories). In a first experiment (Fig. 5e), tumor dimensions were measured twice weekly until the sacrifice at day 35. A second experiment was carried out and followed for a longer time period (Fig. 5f). Mice were sacrificed when tumors reached a volume of approximately 2 cm3 (volume = a × b2/2; a and b are the two registered perpendicular diameters, with a > b); otherwise, they were monitored for 6 months (control mice). Animal care and use for this study were performed in accordance with the recommendations of the European Community (2010/63/UE) for the care and use of laboratory animals. Experimental procedures were specifically approved by the ethics committee of the Institut Curie CEEA-IC #118 (approval: 2016-014) in compliance with international guidelines. Normal breast tissues from ten women undergoing cosmetic breast surgery were used as a source of normal RNA. Four hundred forty-eight primary breast tumor samples were retrospectively collected from patients undergoing surgery at the Institut Curie-Hospital Huguenin. The sample series was specifically selected to encompass the various stages of breast cancer progression and the tumors’ molecular subtypes, defined as previously described . The median follow-up of the patients was 101.7 months (range = 4.3–250 months). The study was performed in accordance with the French Bioethics Law 2004–800 and the French National Institute of Cancer (INCa) Ethics Charter, and after approval by the Institut Curie review board and ethics committee (Comité de Pilotage du Groupe Sein), which waived the need for written informed consent from the participants. Women were informed of the research use of their tissues and did not declare any opposition to the research. Total RNA extraction, cDNA synthesis, and PCR reaction conditions have been described in detail elsewhere . WWOX or VOPP1 mRNA levels were calculated using the ΔΔCt method and normalized to the TATA-box-binding protein transcript expression levels. The primers sequences were as follows: VOPP1-for: 5′-GGCTGTGGTACTTCTGGTTCCTT-3′, VOPP1-rev: 5′-GTGTAGGACACATTGAAGGCTGG-3′, WWOX-for: 5′-CTGGGTTTACTACGCCAATCACA-3′, and WWOX-rev: 5′-GCAAATCTCCTGCCACTCGTT-3′. For the immunohistochemical study, paraffin-embedded sections of human tumors were prepared as described . Briefly, human biopsy specimens of 24 primary breast tumors were deparaffinized, treated with 3% H2O2, and incubated with anti-VOPP1 antibodies (Proteintech). The staining signals were revealed with the Dako REAL Detection System, Peroxidase/AEC kit. The slides were counterstained with Mayer’s hematoxylin. Tumors with high levels of VOPP1 transcripts were subjected to DNA extraction. The quality of tumor DNAs was verified using a Qubit dsDNA BR Assay Kit (Thermo Fisher Scientific). Tumor DNAs and reference DNA provided in the Agilent Kit were labeled, purified, and co-hybridized in equal quantity to the Agilent Microarrays, for 21–24 h. Arrays were washed and scanned on a SureScanMicroarray Scanner according to the manufacturer’s protocols (Agilent). Images were acquired using the CytoScan Software V.2.7 (Thermo Fisher Scientific) and analyzed on CytoGenomics Software V.2.7 (Agilent). Statistical calculations were performed using PASW Statistics (version 18.0; SPSS Inc.). To determine whether VOPP1 expression and the VOPP1/WWOX ratio were associated with patient clinical outcome, survival distributions were estimated by the Kaplan-Meier method, and the significance of differences between survival rates was ascertained using the log-rank test. The classification of tumors in “high VOPP1” or “reduced WWOX” vs. “normal groups” in Fig. 7 were obtained by using a threshold of < 0.6 for reduced WWOX levels and ≥ 2.5 for high VOPP1 levels. Multivariate analysis using Cox proportional hazards model was used to assess the independent contribution of each variable to metastasis-free survival. The Cox proportional hazards assumption was graphically checked by plotting a log-cumulative hazard rate for each variable, and we did not find statistical evidence for violation of this assumption in any of the regression models. François Lallemand and Keltouma Driouch contributed equally to this work. We thank the Hybrigenics staff for their contribution, the staff of Curie-Hospital René Huguenin for their assistance in specimen collection and patient care, and Lou Cadau for the excellent technical assistance. We are grateful to Dr. R.I. Aqeilan for kindly providing the Myc-WWOX and Myc-WWOXY33R plasmids and Dr. G. Melino for kindly sharing the HA-p73α construct. This work was supported by La Ligue Contre le Cancer (N°2FI10655MMGF), the GEFLUC, and a GenHomme Network Grant (02490-6088) to Hybrigenics and Institut Curie. F. Bonin and Z. Tariq are supported by a grant from the Breast Cancer Research Foundation (BCRF, USA, BCRF-16-096). The datasets analyzed during the current study are available in Oncomine and Gene Expression Omnibus (https://www.oncomine.org/resource/login.html, https://www.ncbi.nlm.nih.gov/geo/query/acc.cgi?acc=gse2034, and https://www.ncbi.nlm.nih.gov/geo/query/acc.cgi). FL, RL, and KD contributed to the conception and design. FB, JC, EF, GP, and IB contributed to the development of methodology. FL, FB, AP, SN, NB, ST, KT, PA, SV, KAR, and LF contributed to the acquisition of data. FL, FB, ZT, and KD contributed to the analysis and interpretation of data. FL and KD contributed to the writing, review, and/or revision of the manuscript. JC, AV-S, IB, RL, and KD contributed to the administrative, technical, or material support. FL and KD supervised the study. All authors read and approved the final manuscript. The study was performed in accordance with the French Bioethics Law 2004–800 and the French National Institute of Cancer (INCa) Ethics Charter and after approval by the Institut Curie review board and ethics committee (Comité de Pilotage du Groupe Sein), which waived the need for written informed consent from the participants. Women were informed of the research use of their tissues and did not declare any opposition to the research.